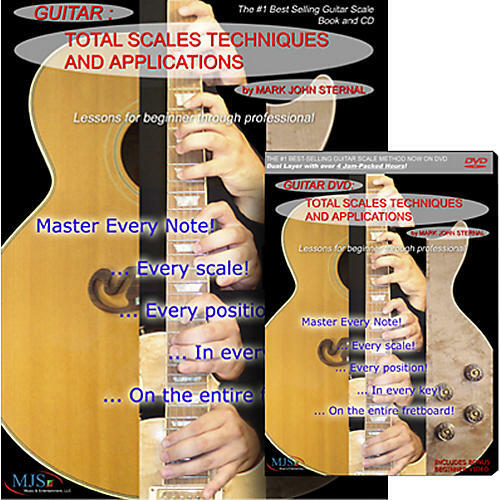 Master every note in every scale in every position in any key on the entire guitar fretboard. Build on your guitar playing skills with this set which includes the Guitar: Total Scales, Techniques, & Applications DVD, 176-page book, and CD featuring narration and performances. This complete course starts with a bonus beginner section to insure that any guitarist at any level can use the lessons on this video. It quickly progresses to intermediate-then advanced levels of guitar playing. First, you'll learn universal shapes found in every key of music to expertly play scales and leads on the entire fretboard. Don't worry about memorizing these positions. Memory will come naturally when Mark John Sternal demonstrates how to use these scales musically. Tasty licks, tricks, and techniques like hammer-ons, pull-offs, picking patterns, vibrato, string bending, two-hand tapping. Plus techniques exclusive to electric guitar including tremolo bar, string bending, and electronic control tricks. In addition, you'll learn a ton of applications to make your lead guitar and melody lines stand out, and make learning your favorite songs a breeze: increment patterns, string skipping, double note patterns (harmony), two-handed tapping, harmonics. All of this and more is introduced in a song context, giving thorough examples of how these scales, playing methods and applications can be used with chords and song structure. To wrap up this instructional DVD, Mark teaches you all of the modes, key changes, plus 50 exotic and cultural scales-all on the entire fretboard.